Harpreet Sandhu is receiving support from unexpected quarters. In a blow to China’s cycle component industry ,reeling from global meltdown, cycle and cycle parts industry here has decided not to import Rs 400-crore cycle components from China. The local industry has started in-house production of the components. The decision of the government to allot 17,053 acres in the pond area along the Beas, the Sutlej and within the barbed wire fencing in Gurdaspur was blatant attempt to regularise encroachment on government land by the politician- bureaucrat- policeman mafia. 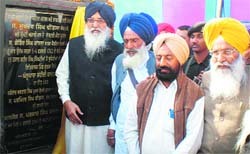 Reacting to a recent statement of PPCC campaign committee chief Amarinder Singh, saying the Congress would approach the Election Commission, seeking deployment of central police forces for the general election, Chief Minister Prakash Singh Badal said central forces were needed during the Congress regime for the general election. The SAD-BJP government did not indulge in excesses on workers of any political party. The ongoing chain hunger strike call given by Rural Medical Services Association (RMSA) entered its fourth consecutive day today. The feverish pitch of the call given by RMSA was further strengthened by admission of a VVIP patient in the roadside intensive care unit (ICU) of rural medical officers. The Punjab Institute of Medical Sciences (PIMS) project, that had been hanging fire for over 15 years, will be functional in six months. The statement of Ajmal Amir Kasab arrested in connection with Mumbai strikes, in custody did not have much value in the international law , said former DGP Punjab KPS Gill. Gill was here today for a seminar on terrorism. The Forest Department has launched green- urban areas campaign by setting up ‘forest awareness parks’ on land earmarked for forests. Dr JP Singh has taken over as the new director, Health Services, Family Welfare, Punjab. He is an MS in general surgery. He joined the state government as a medical officer at PHC Paldi in district Hoshiarpur in the year 1981 and later got promoted as senior medical officer (SMO) at Phillaur in the year 1987. He also later remained posted as SMO at Samrala and Khanna. 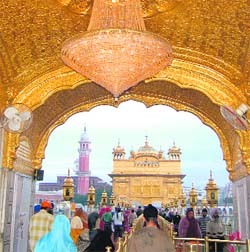 Punjab Public School, Nabha, will celebrate golden jubilee in April 2010. The year-long celebrations started here today with talk on “India’s Democracy: Her peerless Assets” by Wajahat Habibullah Chief Information Commissioner India. About 100-foot high iron scaffolding put up to install decorative glass on the ceiling of the arrival terminal of Rajasansi International Airport here came crashing down yesterday. The official Maruti Gypsy, belonging to the DSP (Traffic), here has not been found so far. The vehicle, with a wireless set fitted on it, was stolen from outside the residence of the DSP in Jamalpur Urban Estate on January 18. The Aggarwal Sabha has urged the Congress for a Lok Sabha seat in the Malwa belt claiming it had strength to influence outcome of several seats in the state. The three boys, who had killed a couple and their son last night by repeatedly hitting their vehicle with a SUV, were arrested today.